Welcome to the AFP Mid-Hudson Valley Chapter job posting center. This service is designed to share pertinent career information with our audience of development professionals in the Hudson Valley area. 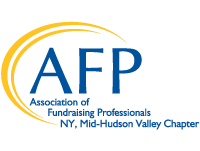 We feature all career position announcements for one month on our AFP Mid-Hudson Valley Chapter website. Anyone who visits this site will see your position announcement on our Chapter Job Center. In addition, your position will be sent out in via email to our entire membership listing with a link to the job center. This email reaches close to one hundred fundraising professionals in the Hudson Valley. Please email your job posting to mhvafp@gmail.com. Your information will be reviewed, edited if needed, approved and posted by our Chapter Administrator. Your organization will be invoiced within 3-5 business days. Contact Chapter administrator Sarah Pruschki at mhvafp@gmail.com if you have any questions regarding job postings or payment. To pay an existing invoice please click here. Click on each job title to view a full description. 2/14/19 Development Director/Grant Writer - The Bardavon 1869 Opera House, Inc.